If the bothy I'm wryly refering to as the Winter Palace is to be built in one weekend - hopefully in one day - a lot of preparation has to be done first. Let's start with the basics: materials. The winter palace comprises straw bales, timber, render, insulation and a few other things. It would be elegant if the straw bales came from barley crop and, in theory, they might. But I'm not confident that my barley will be ready to harvest in time, so it would be prudent to get bales from another source. Similarly there would be a lot to be said for using timber from my own wood; in terms of energy and the environment it would be the best solution. But I'm not at all confident we can mill enough timber in time and even if we do it will be horribly unseasoned. So, again, it may be prudent to buy the timber from the builders' merchant. On the matter of render, the choices are clay or lime. I'll need between two and three cubic metres. Clay will cost the labour of digging it and hauling it on site; lime will cost real money. Lime is the preferred option but may simply be unaffordable. The bothy will be built on three oak rails lying on a stone foundation. The foundation is in place now, but not perfectly level. Some components of the rails are cut, but most are not. Getting the rails to site will need, probably, Alex's Unimog. The rails will then need to be assembled on site and levelled. That's a job for probably two people over two days, in dry weather. If I can't afford lime render I'm going to have to dig clay. Three cubic metres is a lot of digging. Also, I can't really haul that back in my car, I'll need to borrow a trailer and something to pull it. Two people, one day, and again dry weather would make it enormously more pleasant. On sober reflection, three cubic metres of water is (obviously) three tons, and clay is substantially heavier than water; so that's quite a large trailer and it probably needs to be a tractor! One of the issues with a straw bale structure is that although bales from the same batch - baled with the same baler on the same day with the same tension settings of straw from the same field - are likely to be consistent in length, you don't know until they're delivered exacly what that length will be. The walls sit on a sill plate and are capped with a wall plate, each of which will be essentially a box structure. The box structures can be prefabricated, but need to be constructed to the maximum likely length and designed to be easily shortened on the day. The roof is supported by four main trusses. Again, the trusses can be prefabricated. The front and rear trusses will probably eventually have windows in them, and it's possible that the frames for these windows can be prefabricated at the same time. There will probably be a back door and there will certainly be a front opening. Each of these openings needs to be framed so as to support the walls. The frames can be prefabricated. All this prefabrication can take place in the Void, so can happen on wet days; but it can't happen until I have timber and I'd estimate that it's at least a week's work. The floor can't be laid very long before the main build since it won't benefit from getting wet, but it doesn't need to be laid on the very same day as the rest of the build, provided it can be protected by tarpaulins. Laying the floor is neither hard nor especially time consuming; two people could easily do it in one day and I could easily do it by myself in two. All that adds up to a fortnight of my time and a few days of other people's time, over a period of six weeks; it shouldn't be impossible. On the day I propose to have four teams, Carpentry, Catering, Transport and Walls. The job of the Transport team is obviously to make sure that everything is on site when needed. If we have a spell of settled weather this isn't an issue since everything can be stacked on site in advance. Render can be stacked on site in advance anyway. But otherwise I'll need a tractor or 4x4 with trailer, and one or two people to help load/unload. Until the bale walls are built the Carpentry team can help Transport. The job of the catering team is to feed everyone. Walls team starts the day by assembling the bale walls onto the sill plates, which should already be in place, and staking the bales with the hazel rods. Apart from the front opening and the rear door there are no holes or other openings in the walls, so this should be very fast - an hour at most. Obviously it's important that they be vertical! Once the walls are up and the wall plates have been fitted, walls team's job is to apply render. About 2.5cm of render has to be applied to both inside and outside of the walls, all over. However, as rendering is going on the carpentry team will be working on the roof, so some co-operation will be needed, and generally the carpentry team's needs will take priority. The Carpentry team don't start work until the bale walls are up. Until then, they can help transport team bringing materials to site. Once the walls are up, they install and fit first the wall plates, then the main trusses and their cross-braces, then the inner vapour barrier, then the purlins, then the insulation and the outer vapour barrier. At this point the roof is more or less weatherproof and the walls are protected; if this is as far as we can get that's OK. However, I'm hoping we can get further. If we have enough carpenters to divide into two teams, one team will be set to cladding while the other is set to lining; if not, cladding comes first, lining happens later, and, indeed, need not happen as part of the build weekend. If there's time it would be nice to dismantle the summer palace, and to use its wood to construct the bed-loft mezzanine. It would also be nice to have the flue fitted. The object of the weekend is to get main structure up and weatherproof. It isn't intended or expected that to have a completely finished building. Render will have to dry before the interior walls can be painted, and that must be done before furniture can be moved in. I don't envisage fitting the back door, or panelling or glazing the front opening, as part of the build weekend. This is partly because I will need through draught to dry the clay render, and partly because frankly I haven't a clue yet how I'm going to fill the front opening (although, obviously, as much glazing as possible is essential). 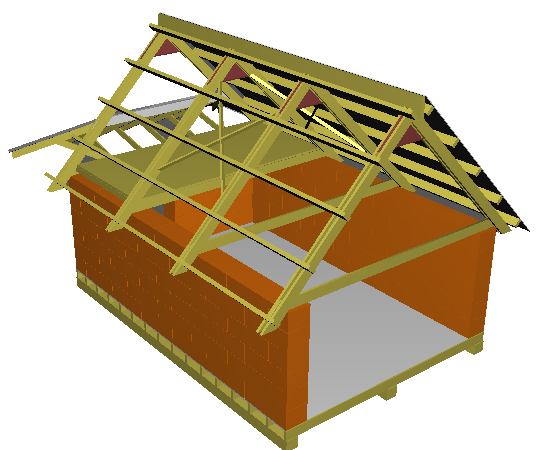 The rear gable opening is also intended to be eventually partly glazed, but it may be partly panelled before being erected. While I shall almost certainly sleep in the new structure on the Sunday night (because the summer palace will very likely no longer exist) I don't expect to be fully moved in until 17th October.